Ryan's Smashing Life: The Best of Elvis Costello: The First 10 Years - With a Twist: Secret Recordings! 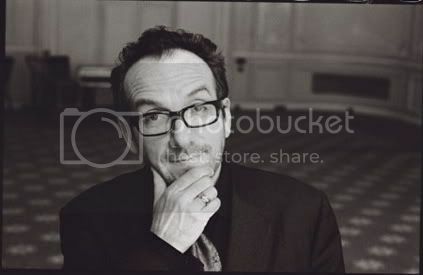 The Best of Elvis Costello: The First 10 Years - With a Twist: Secret Recordings! As if a tour with Bob Dylan this year and a re-release of his celebrated career material wasn't enough - Elvis Costello had to up the ante.... Ten randomly selected packages of ELVIS COSTELLO: The First 10 Years will have an added bonus. Ten of the copies of this collection have hand-recorded CDRs with home-recorded material popped in by Elvis Costello personally! Talk about bonus material....! "I recorded some new melodies for some of my older songs, and for a gag I recorded them on just a cassette player. And I didn't have a microphone so I plugged in headphones into the tape recorder, because you switch them backwards, they work as a microphone. I didn't want to be like a Luddite, so I put them on a CDR, and I put 10 of the CDRs in 10 copies of the best of record that we released in April, and hid 'em in the shops in America, just to see whether anybody bought records anymore. And as nobody's found 'em yet and it's now September, I guess nobody buys records anymore. But somewhere somebody's gonna get a little surprise one of these days... They're gonna be in Wal-Mart or somewhere, and they're gonna buy one of these records and they're gonna discover a little free gift from me... There's not enough fun with the business of music. It's all very serious. The record thing for as long as it's gonna last, it needs a little mischief put back into it." Whoa. That would be good to have! According to sources at Filter magazine, Costello's story rings true - there were secret recordings popped into the 10 Years collection - but only in American copies. So if you had hesitated before, maybe now is the time to pick it up! ooooh, I've never heard this alternate version of "Busy Bodies"